Clyde William Tombaugh discovered Pluto in 1930. In the course of his career he also discovered hundreds of asteroids and stars. It is therefore fitting and uncommonly cool that approximately one ounce of his ashes, (he passed in 1997), are aboard the New Horizons spacecraft, which was launched in 2006 and is due to make a near pass at Pluto in 2015. 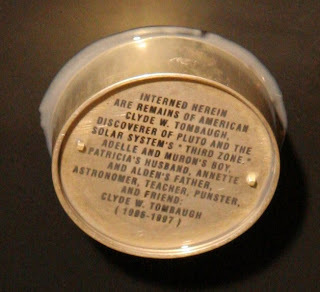 "Interred herein are the remains of Clyde W. Tombaugh, discoverer of Pluto and the solar system's "Third Zone". Adelle and Muron's boy, Patricia's husband, Annette and Alden's father, astronomer, teacher, punster, and friend.